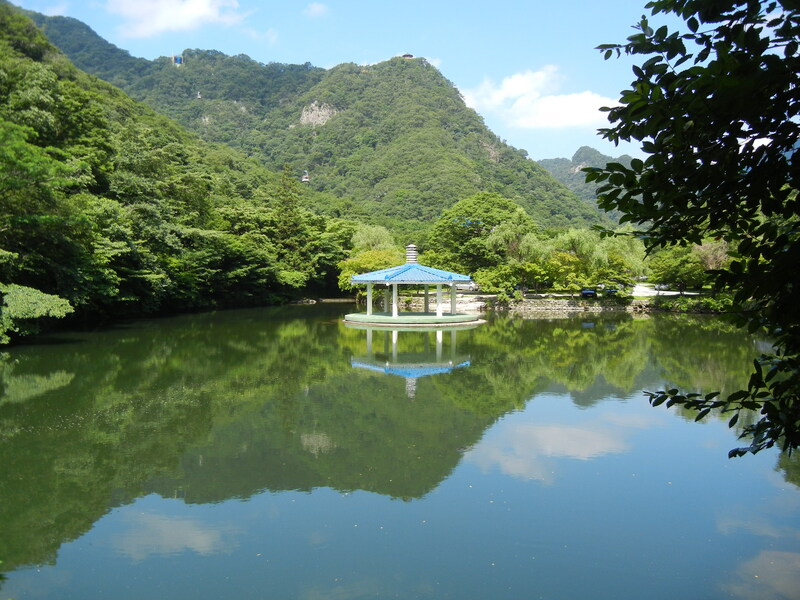 This weekend I did a hike from Jangsan subway to Songjeong Beach to Haedong Yonggungsa Water Temple. 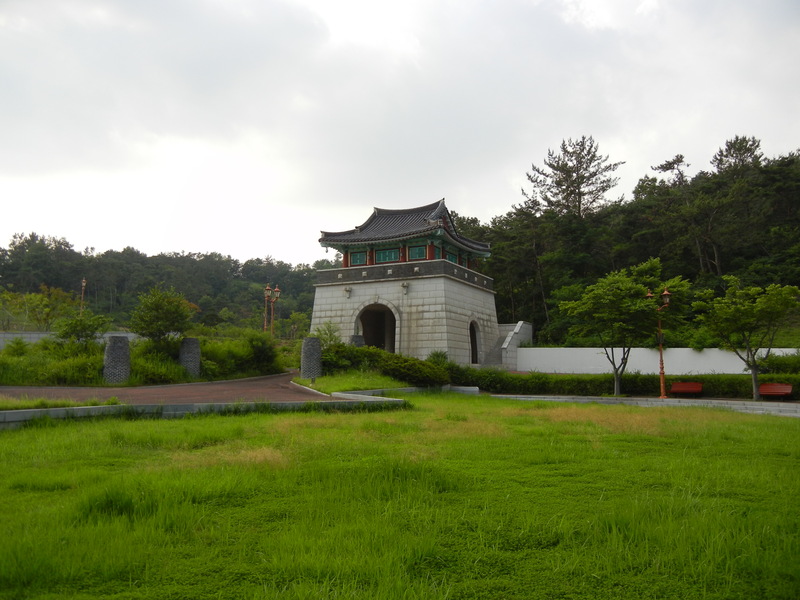 We started to follow these directions to Songjeong and these to Haedong Yonggungsa Water Temple but the Koreans with us kept asking people along the way and then changed course multiple times….so below is what we actually did. From exit 1of Jangsan, turn right for a bit (past what I think was a school because it had tons of kids toys out front) and then left at the big intersection and follow that until you are at the top of a hill. This will all be though apartment complexes. From the top of the hill turn left and go uphill on the wooden path next to the road. We got to the top of that and were told we had to go back because it is ‘too dangerous’ to go down the way I wanted. This was from Koreans, and most of us agreed that it probably was not dangerous at all (in a country where you’re not allowed to go in the ocean more than 20 feet and have to wear a life vest at water parks, something being ‘dangerous’ could be exaggerated) but some people were wearing flip-flops and the Koreans with us didn’t want to go that way. 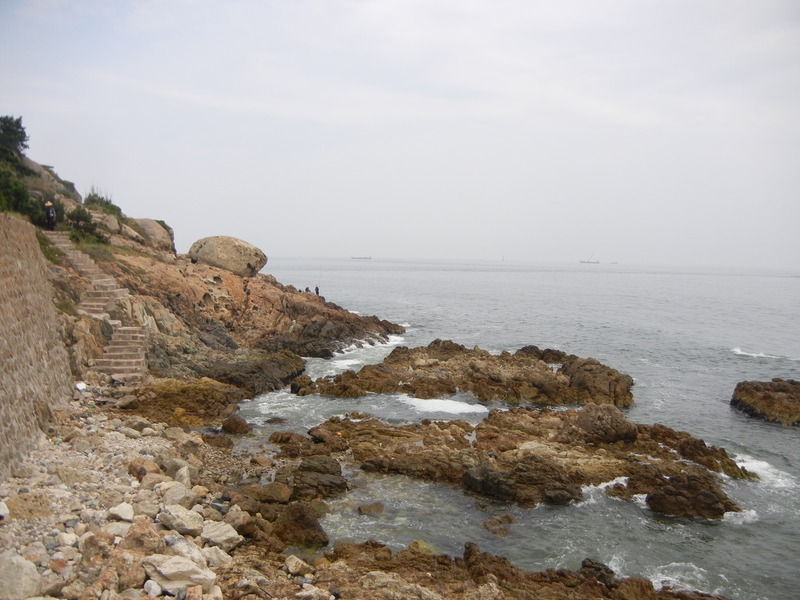 Here we went back to the start of the wooden path and went down some steps and followed the road, veering left and following the road past some seafood restaurants until it ended and we climbed over some rocks to get to a railroad we had to walk next to for a bit. A train came which was pretty scary (and hot) and we saw a sign later saying there is a 10,000,000 won fine for walking there (although at the place we started it was obvious that many people did this and the sign there just said ‘danger, keep a look out and don’t walk on the tracks’). 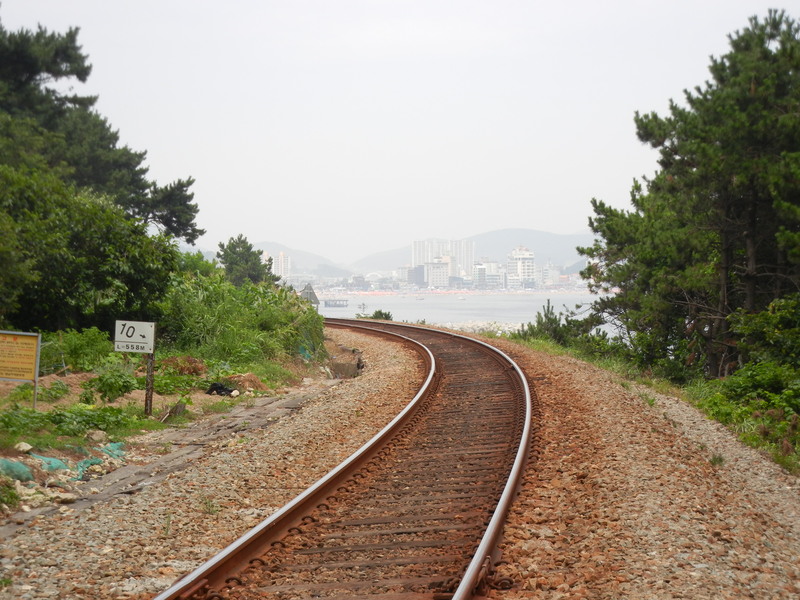 When we could, we stopped walking next to the tracks and followed another road along the coast until we got to Songjeong Beach. 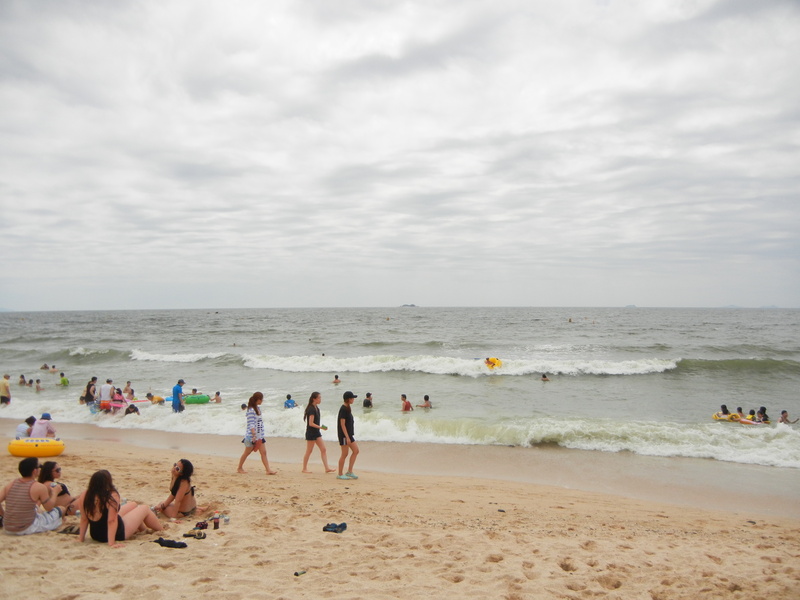 We hung out here for a bit and listened to funny announcements, such as ones telling us that this beach is for relaxing, and no ball playing is allowed or another one saying that if you take your pet into the water it will confuse other people so don’t do it. From the other end of the beach walk left (if you go right you will go around a little island) and walk along the street until you get to a CU. We went behind it and downhill to another fishing village and kept going as straight as we could. At one point the paved road ends and becomes a dirt road, then there are some pipes we thought were for sewage which you have to jump over and walk along a very dirty beach. After that you go into a wooded area which has the trail. I wanted to keep going past the CU and turn in when the wooded area started, so if you want to skip the fishing villages and jumping over a sewage line you can try that. 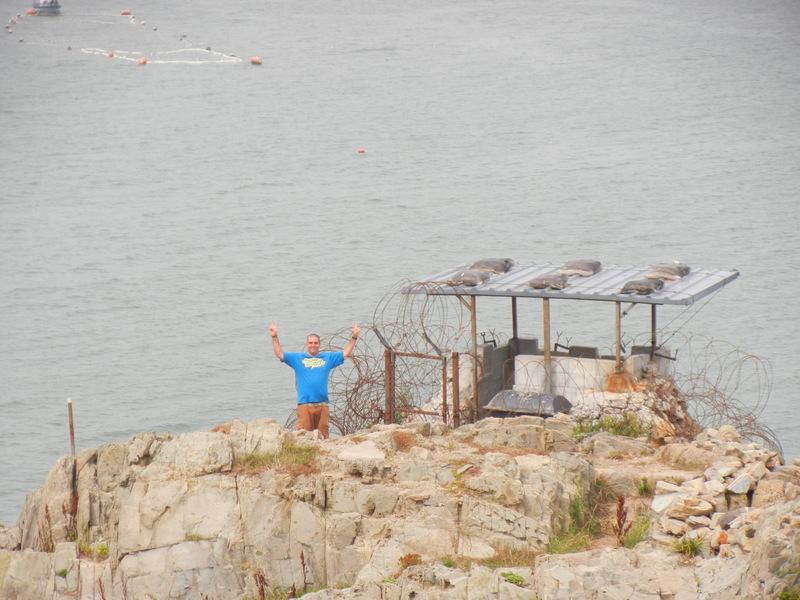 From here we went around the coast and saw a few military buildings and a look out point. To get to the temple we had to wiggle under a gate. I’m sure there was a way to not have to do this as we saw some people coming from that way and signs inside saying to go a different way than the one we came, but oh well. Mudfest is a festival in Boryeong that goes on for 9 or so days in July. 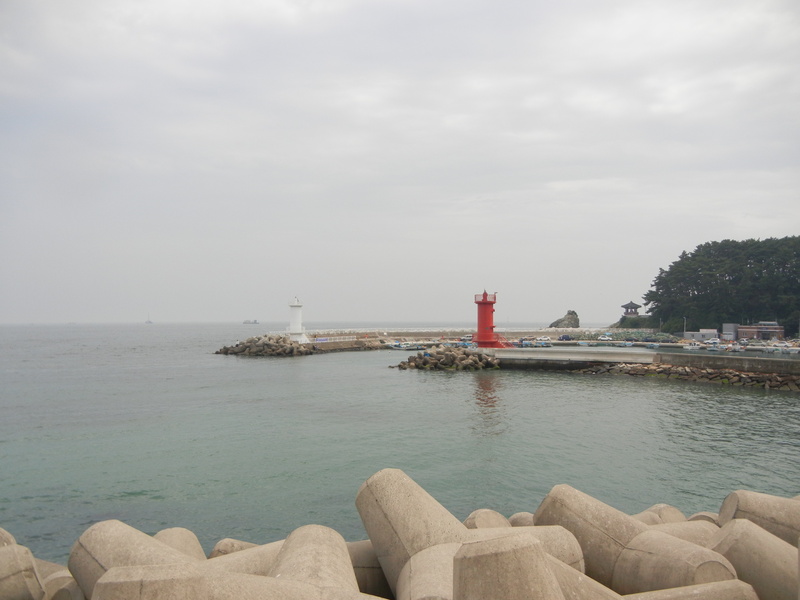 It takes about 2 hours from Seoul or 5 hours from Busan on a bus, but you can take the KTX as well. There’s groups that leave from Busan and Seoul (and I’m sure other cities and towns) so you don’t have to worry about planning anything. There is some free mud, but most you have to pay to get into an area where there are slides and the like but the lines are massive. In hindsight I wish I had not gone there because we didn’t go in for long because we didn’t want to wait an hour (with no food or drinks) in the sun to get back into mud. The one that we did do was fun, where you run and jump onto a slide, like slip n slide but inflated. There were some rocks on it though, which I think was from peoples feet. The beach there was nice because it had real waves! 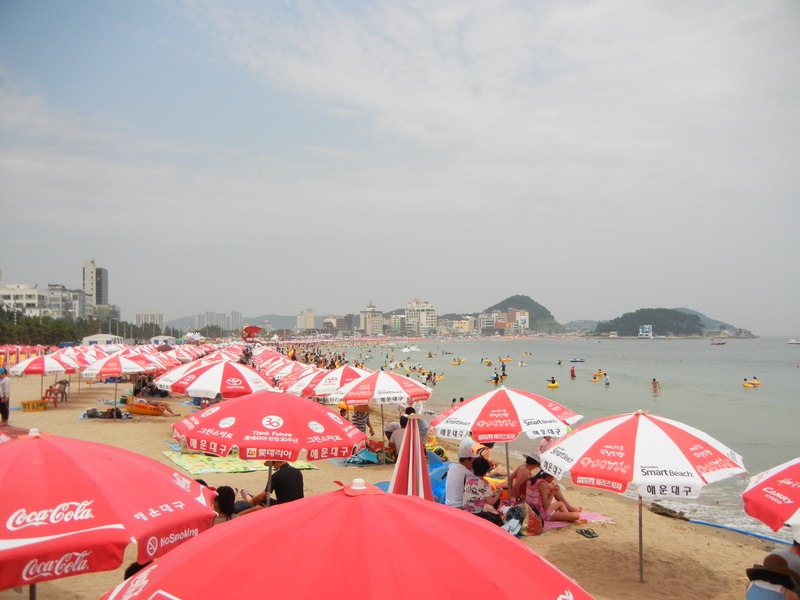 That’s something we’re not used to in Busan and one guy got hit with a wave so hard he fell and got all cut up! He was okay though. Going in the ocean is great for cleaning off if you don’t want to go all the way back to the minbok (the place we were staying, and it seemed like everyone was staying) which is like a hostel but you sleep on the floor. 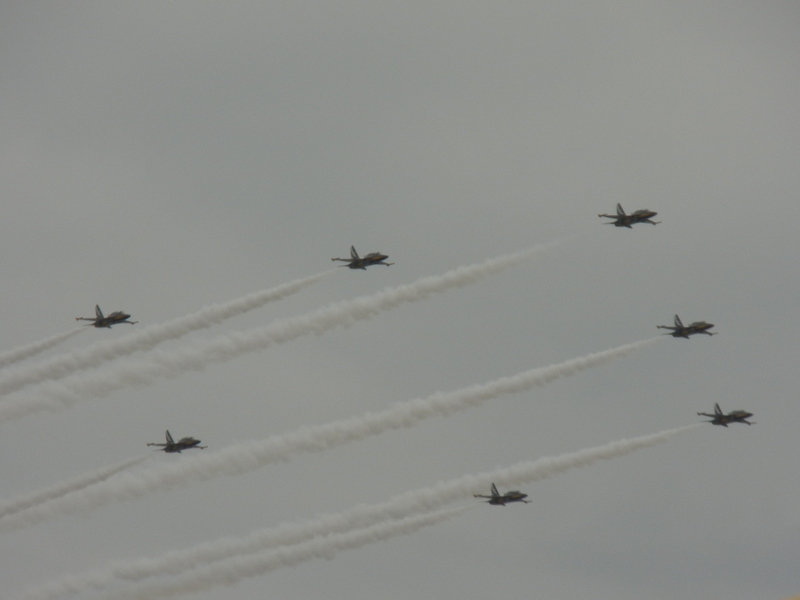 At one point, the Blue Eagles were there and did a mini-show. 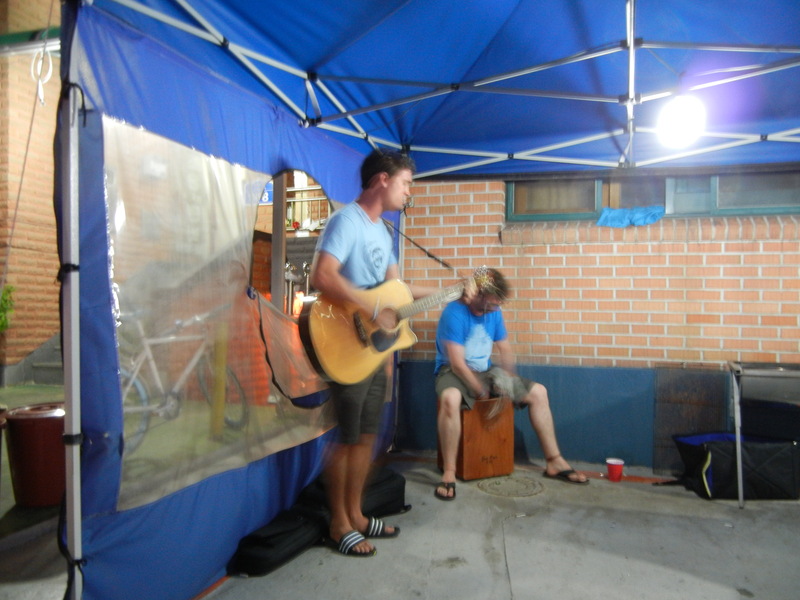 At night my friends played music and there were fireworks. 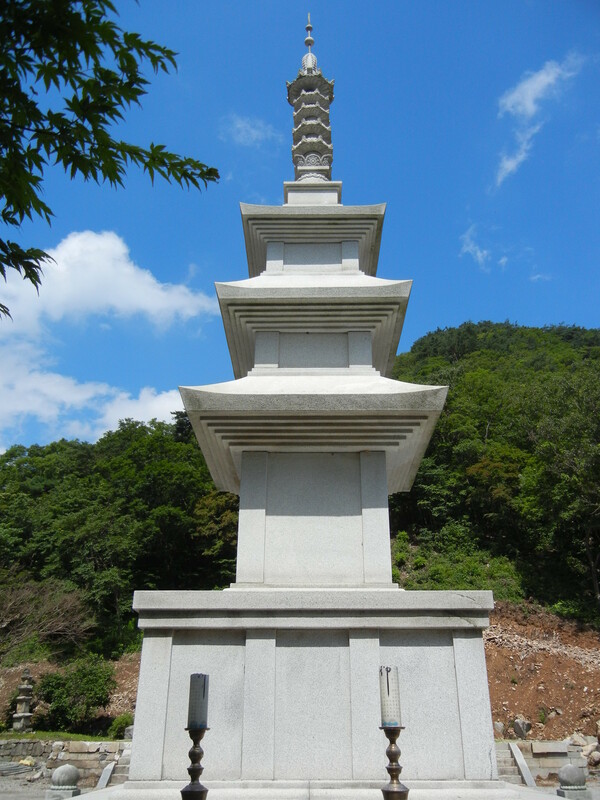 The monthly event at Hongbeopsa Temple for July was a temple stay. As opposed to being free, like all their other events are, this one was 20,000 won, compared to 40,000-50,000 for other temple stays. At 3pm we arrived, checked in, went to our rooms and changed. Next, we had orientation and met a monk from Texas. She came to Korea in 2001 as a teacher and in 2004 became an ordained monk. She had to travel 5 hours to be with us for the temple stay. I am very grateful that she came because she was able to better explain everything we were doing, why we did it as well as what our Western perceptions were as opposed to what is real. There are two main ways to hold your hands. One is pushed together, so no light gets though, with your arms flat. The other is to hold your right hand in your left hand, because the right does the bad things, and place them just below your belly button. This is where our energy comes from, and where breathing comes from when we are younger–if you look at a baby, their stomach moves when they breath, not their chest. It is also important to have good posture, to make breathing easier. Then, we did the Heart Sutra which is the ‘heart’ of Buddhism. Overall, it is about emptiness, which is not negative, but rather just a different state. After we had a break and then silent dinner, which was not too silent because the head monk kept giving us directions on how to lay out our bowls, how to receive the food, how to eat, and how to clean. It lasted an hour and a half but was only silent for about 20 minutes. 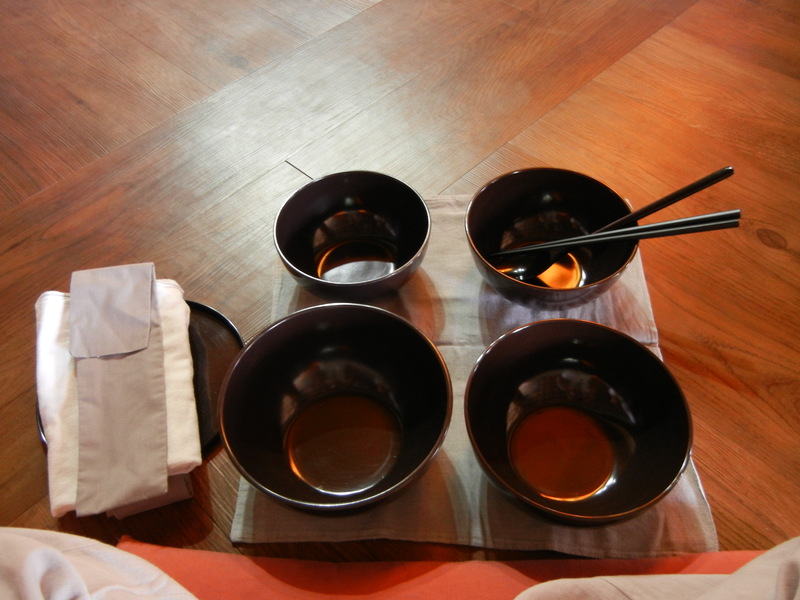 You are given 4 bowls that are wrapped in a cloth, with a place mat folded underneath, napkin on top, and chopsticks and a spoon on top of that. Everything must be taken apart in a special way. Untied, folded in half, the napkin and utensils placed on your left knee, and then the tie is folded in half again. The lid is then removed from the bowls and the tie is placed on top. 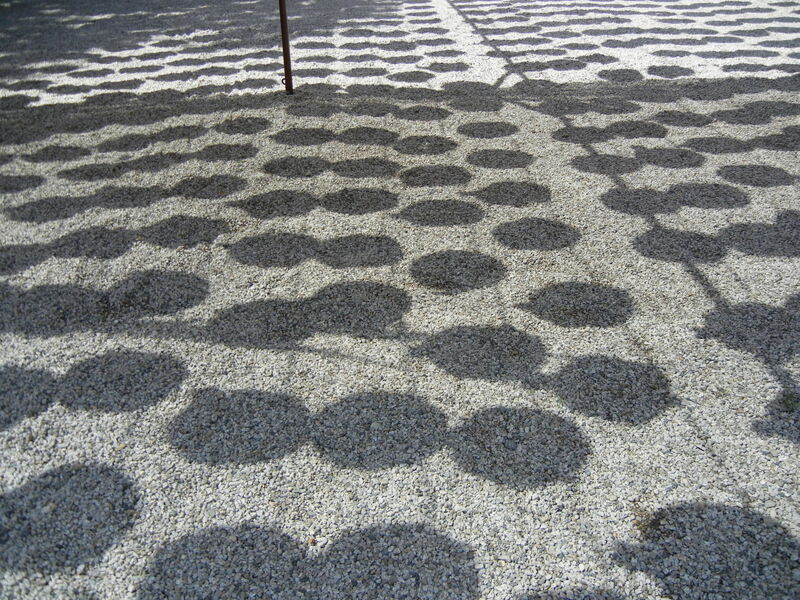 Then, the place mat is unfolded in a the bowls are placed in the left bottom square–this one is for rice. The 2nd largest goes in the right bottom square–this one is for soup. The 3rd largest goes in the right top square–this is for water. The 4th largest (smallest) goes in the left top square–this one is for ‘side dishes’–vegetables and tofu as well as a yellow squash to clean the bowls after. The utensils are placed in the water bowl and the napkin on top of tie. The water is then poured into the largest bowl, swirled around, poured right, swirled around, poured diagonal, swirled around, poured right. Next rice is served and we place it to our foreheads to say thanks. Next, soup is served, then the side dishes are passed. When you eat, you must hold your bowl up to your face so no one sees your eating face. This just made us look around the room a lot–I kept finding my eyes were wandering. To clean warm rice water was poured into the rice bowl and you had to use the yellow squash to clean it by pressing the squash against the bowl with chopsticks. This was poured right, and diagonal. After, we drank the hot rice water so there was no waste. We were also supposed to eat the yellow squash which I find disgusting so I did not eat it. A bunch of ladies in training tried to force me but the head monk made them stop. The hot rice water was not bad to drink, it was just chunky and pulpy which I also find disgusting–I always buy no pulp. Finally the water was poured around the bowls again and then poured into large buckets. Finally, we put the bowls back together with the lid on and place them in a crate and the napkin and other cloth items in another crate with the utensils. Next we had another recess followed by meditation. First we did chanting, which was done in Korean so only the Koreans and the Texas monk chanted–everyone else just followed their actions of bowing. Next was sitting silent meditation for 30 minutes, followed by silent walking for 10, then silent sitting again for 20. During the sitting, we had our hands in another position: making a circle with our fingers overlapping on the bottom and the thumbs just touching on the top. They should not be pushing but just enough together to hold a piece of paper up. A good way to clear your mind and not zone out is to count to 10 or to chant something in your head that you want to change. Meditation should not be something where you are repressing other thoughts; my favorite metaphor she used for this was that a rock does not stop grass growing forever–when you pick up the rock, the grass will grow again. Next we had fruit and went to our rooms at 10. Some people sounded like they were throwing a party which was frustrating since we had to be outside at 4:00. At 10:30 the noise stopped completely though. 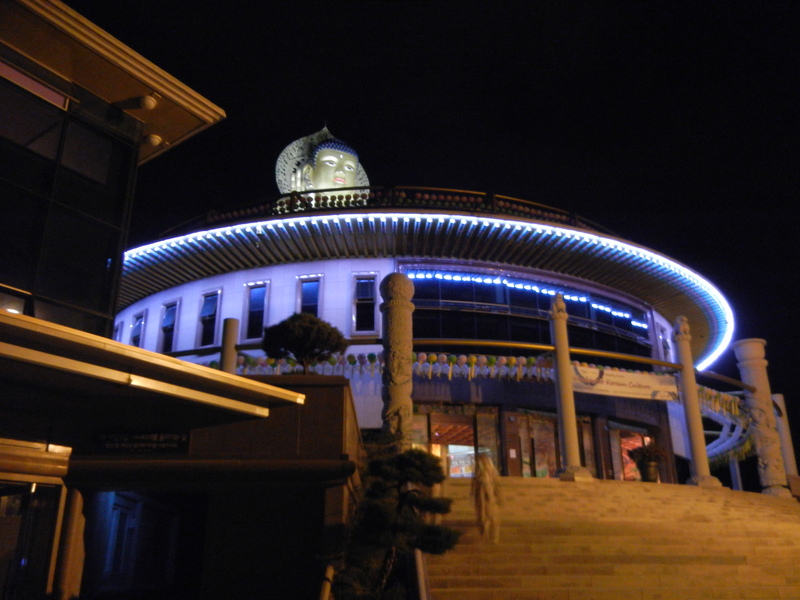 At 4am we went outside and did walking meditation around the grounds and then into the temple. We then did 30 minutes of silent sitting meditation followed by the 108 bows which seemed to go by quickly. I was not counting, but it took about 10 for me to get into a rhythm and at about 70 I was just falling to my knees, not going down slowly; however for the last 10 I was back into a rhythm. After, we did walking meditation next to a river which was beautiful. 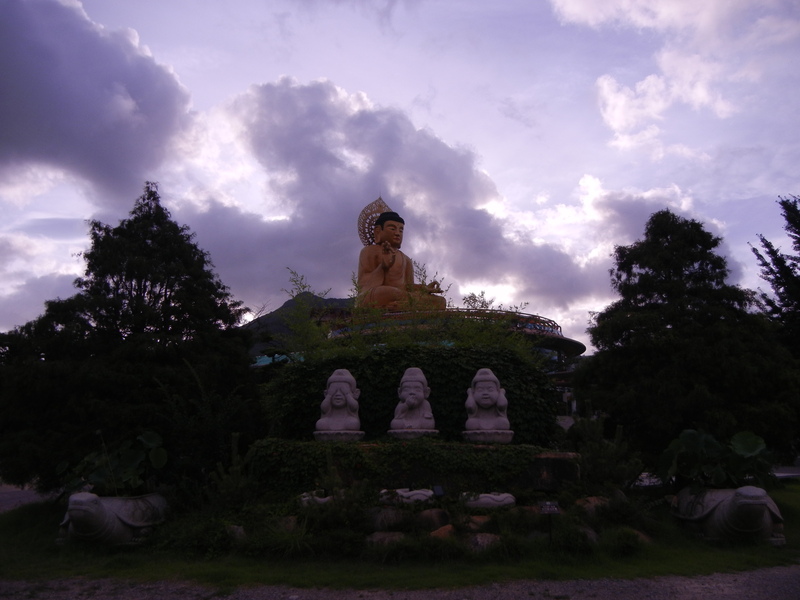 By the time we started walking the sun had come up and rose beautifully behind the Buddha statue atop the temple. Next was a little break followed by picking up leaves, as monks need to be self sufficient and this was our lesson in that. After was breakfast which was rice, vegetables, tofu, and bean sprout soup. Again, we cleaned our own bowls but this time we were able to use sinks. 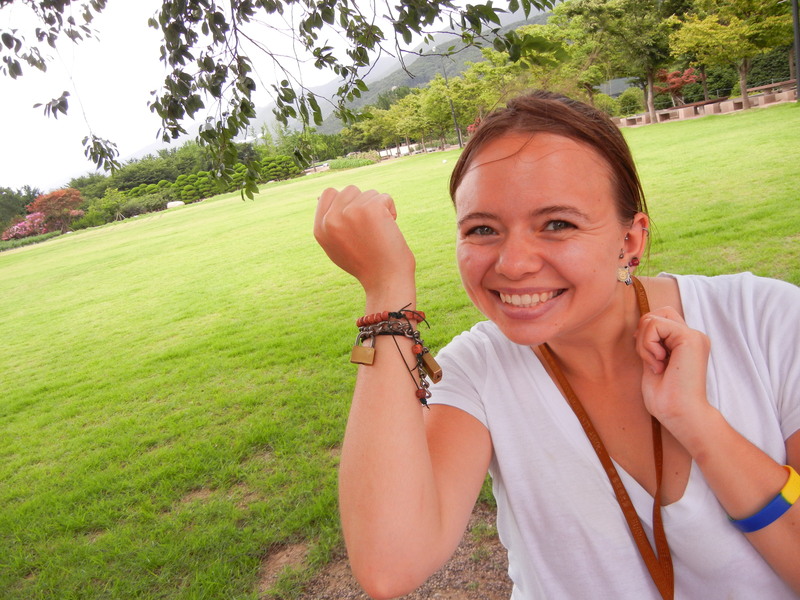 Next we made bracelets which was frustrating. We put beads onto string, which was then tied in a certain way that I never saw because it was taken from me, then given back assuming I knew what she did when her hands were covering anything I was supposed to see. 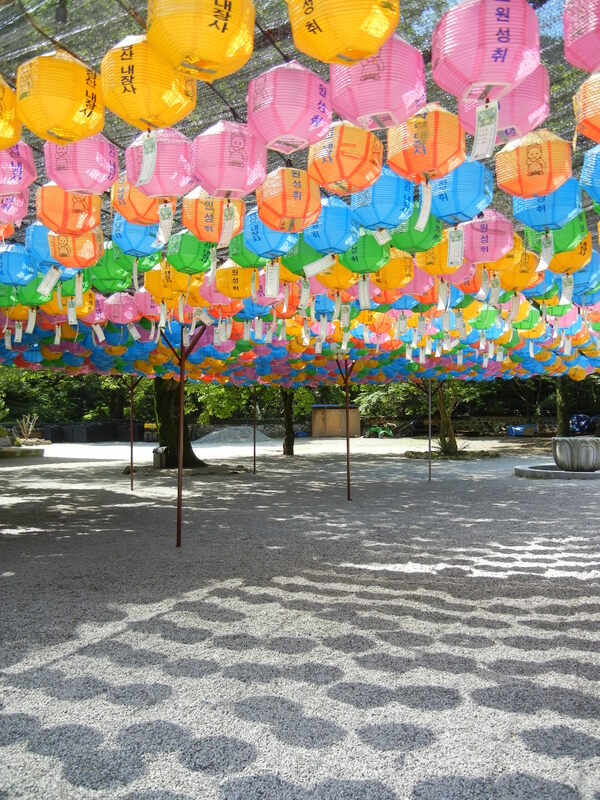 It reminded me of kite making where we were supposed to do the work but everyone came over and did everything for us. Not what I signed up for. I figured out how to continue doing the loop she had done and finished but she laughed at it because it was a spiral and not straight. Oh well, it worked. Many others had the same problem and had a monk make theirs for them. After we finished the drawstring part we added on beads at the ends of the drawstrings and did a different loop there. We were all given one large bead and told not to use it. I then had to give it back to the person leading us. Strange. There were also bracelets made by monks that were supposed to be given by the best 3–and none were given to anyone. Stranger. We ended up leaving at 10:30 instead of 10:00 so it was impossible for me to make the hike that was going on on Sunday. I should have known better because these events always end late. 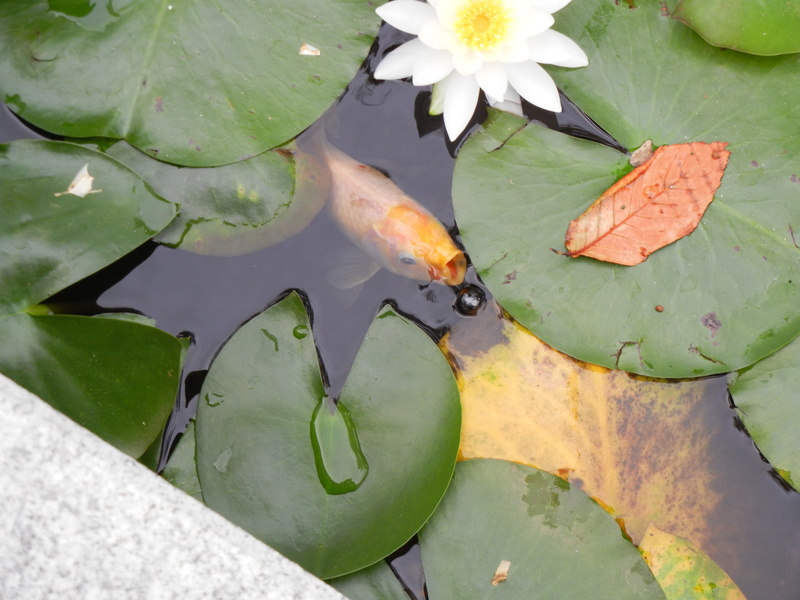 The coy fish were acting strange. Kissy kissy! 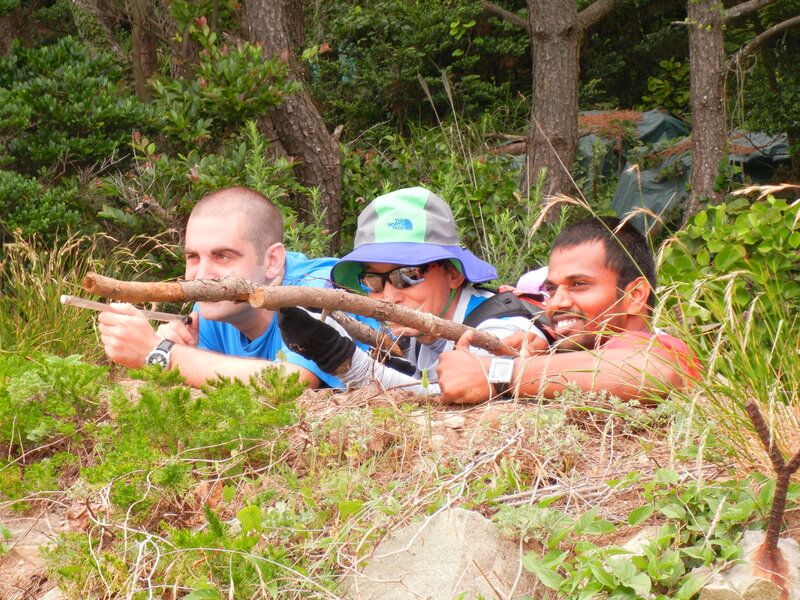 This past weekend I went with Korea Bus Tour Adventures (run out of Busan by one foreigner–American or Canadian, I’m not sure–and one Korean) to Sancheong in Gyeongsangnam-do to go ATVing (or paintballing) and white water rafting with 산청월드레포츠 (or Sancheong world leports in English). The short: don’t go there. 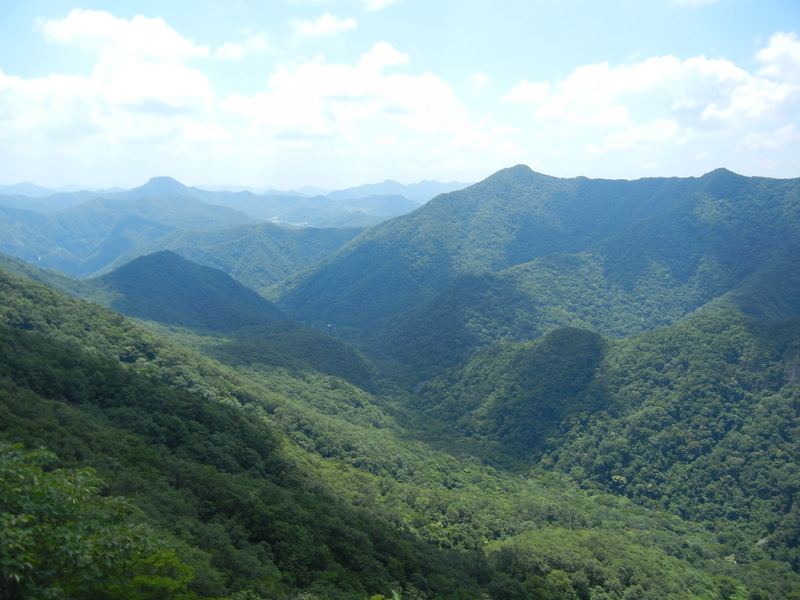 I don’t blame Korea Bus Tour Adventures, but they could have done more research to find out how bad the ATVs and lunch were. And they could have made sure that if we took two buses that the company would have space for all of us. The company sent drivers to pick us up. One got lost making us half an hour later. Due to the strict timing of the tour, this was no good. For a group of two tour buses, the timing should never be that strict. I heard paintballing was fine. There were two groups for the ATVs. We all paid for one hour. This was cut to twenty minutes because of the number of people. 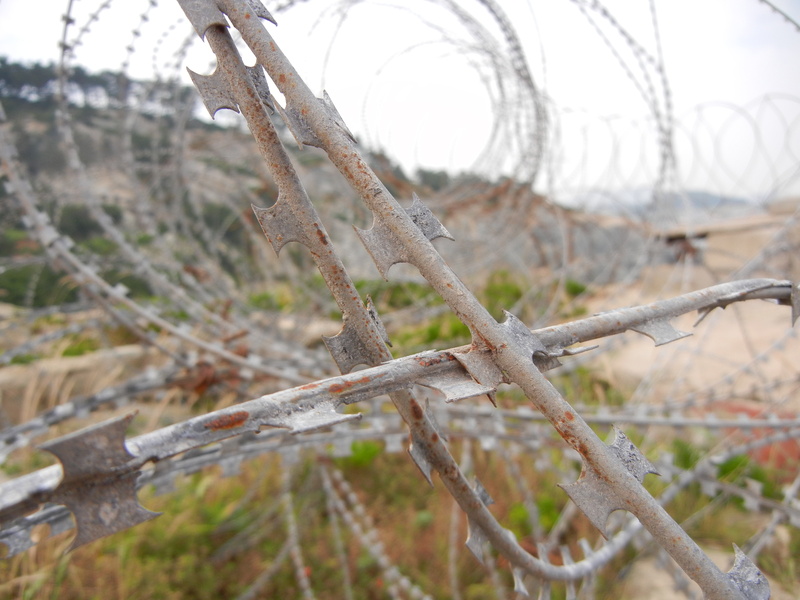 From the way our leaders acted, they did not know this would happen and Sancheong world leports had said they could deal with that many people. I’m not sure though. The other group, so I’m told, just went to one spot and another taking photos, never picking up speed or going near mud. If you see ads from this company with westerners in the photos, no one signed a thing and no one was happy. Lunch was a choice of bibimbap or pork and rice. I had the bibimbap and felt sick for half of the next day; there was also only two vegetables in it. The people who ordered pork started to get less and less every time it was ordered because they were running out. White water rafting was uneventful white water wise but still fun because of splashing and the Korean on our boat freaking out. The safety demo was way too long, we think it was so they could say we spent more time on the water. And the guide here was creepily staring at me before he was our guide. Second time going to this park, thought I’d end up at the same entrance as before, but nope! Not sure how the bus schedule works out here, but we took the same bus and ended up at at the Naejangsan National Park Office and not the Naejangsan National Park Southern Office. 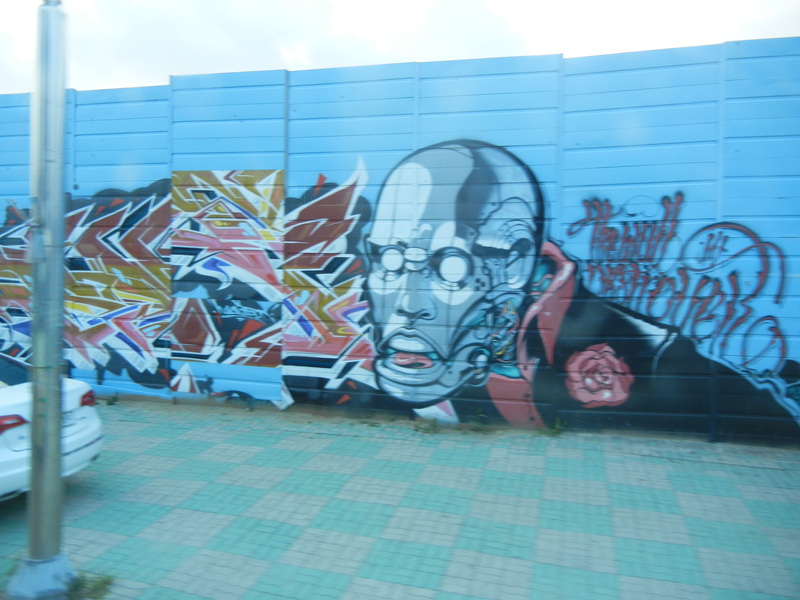 We left Sunday morning on the first bus (8:15) from Gwangju, getting in around 9:15. From the town we walked to the Park Office and paid 3,000 to go in. 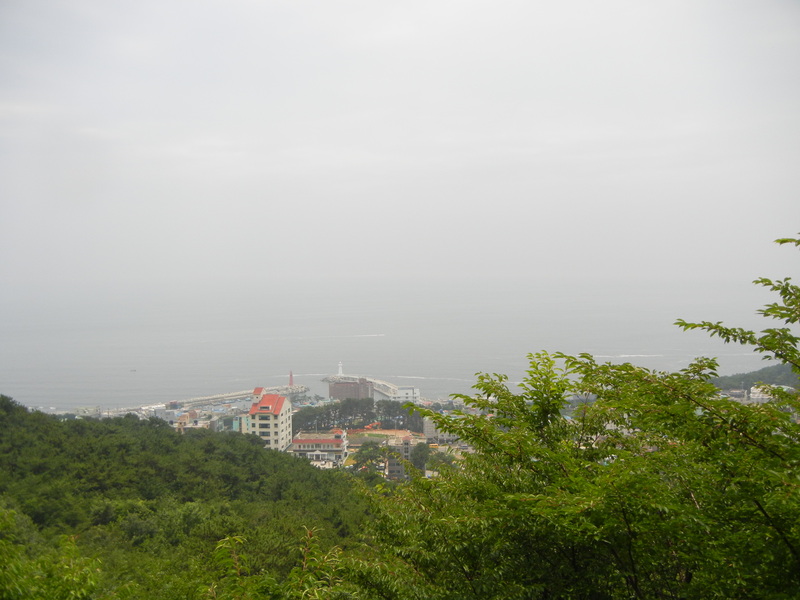 From there, to the Information Center, past Woohwaejeong Lake, the Cable Car and then the Wooden gate, or Iljmun. 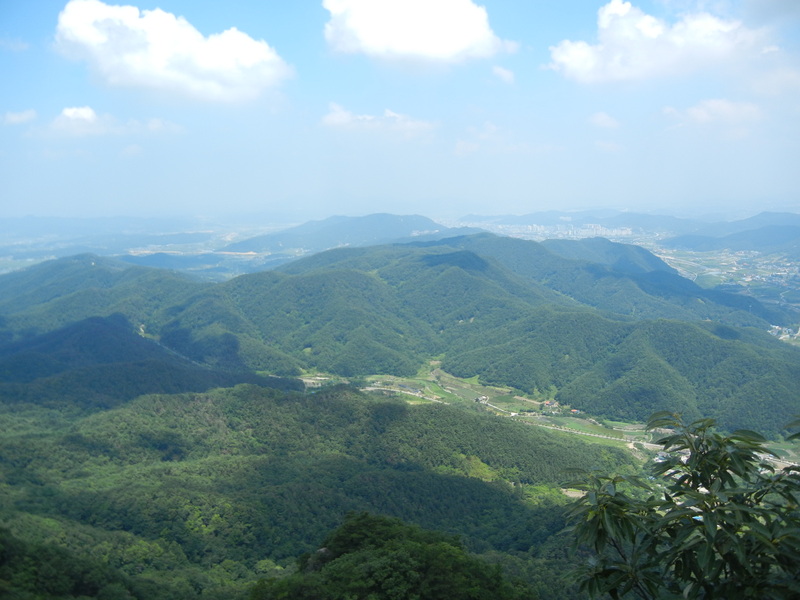 From there we went to the Temple of Naejangsa, and up to Wonjeokam and up further to Bulchulbong which is 622 meters. 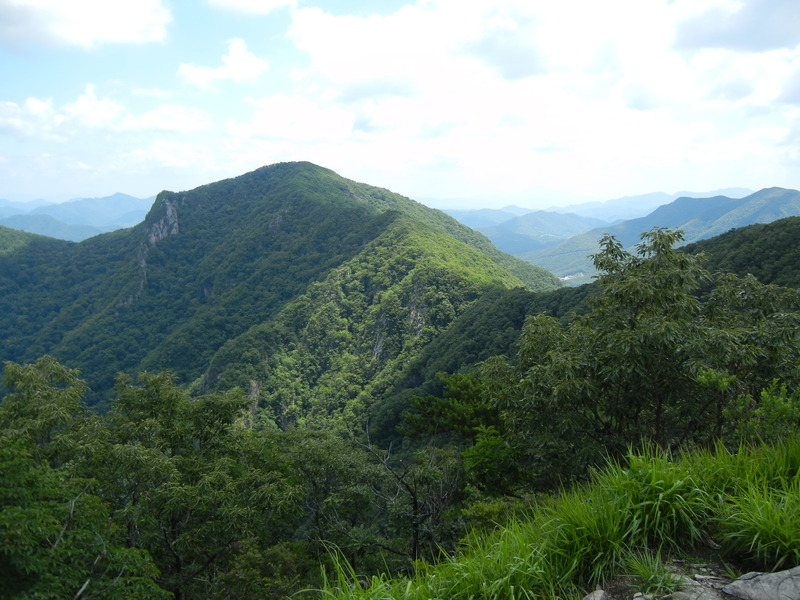 Next was up to Manghaebong (679 meters), down to Yeonjibong (670 meters), up to Kkachibong (717 meters) and then down though Geumseong Valley back to Naejangsa. See below for the map, we followed the purple line. 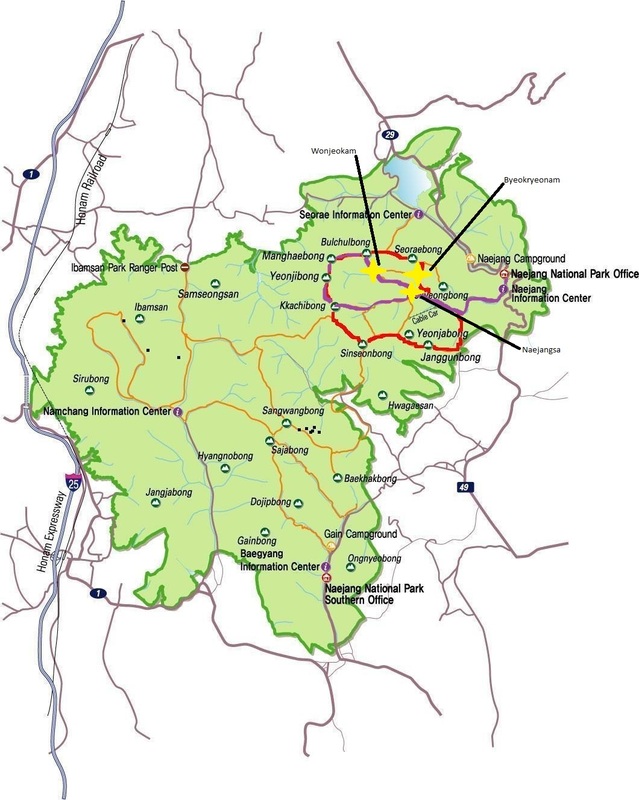 The buses leave from near the National Park Office (10 minutes away) at 9:40, 12:00, and 4:15. 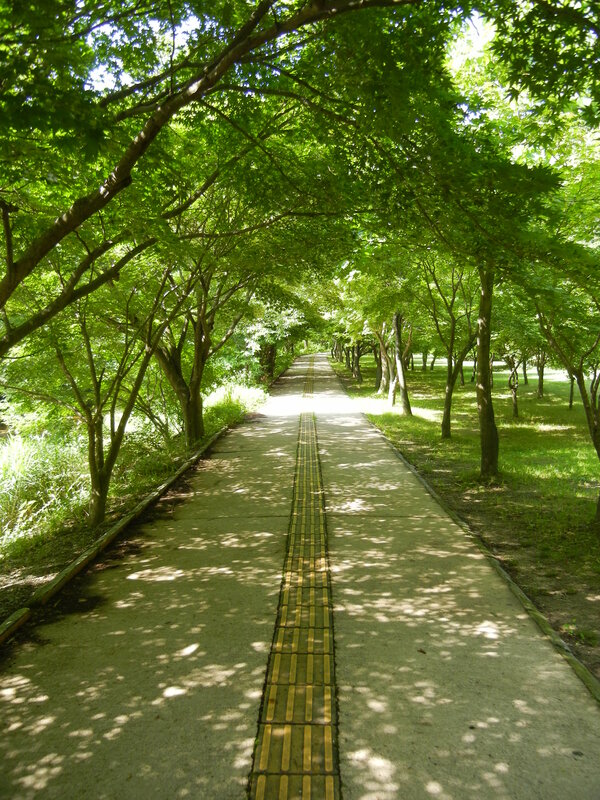 From the Park to the Naejangsa you will be walking under trees like below and past Woohwajeong Lake which has a pagoda. 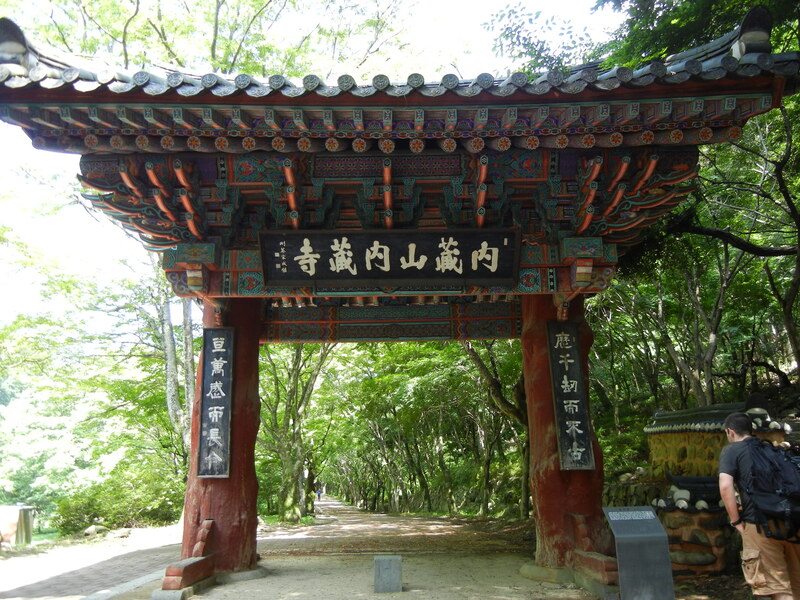 The Wooden Gate, or Iljumun, is below and is 10 minutes before Naejangsa temple. 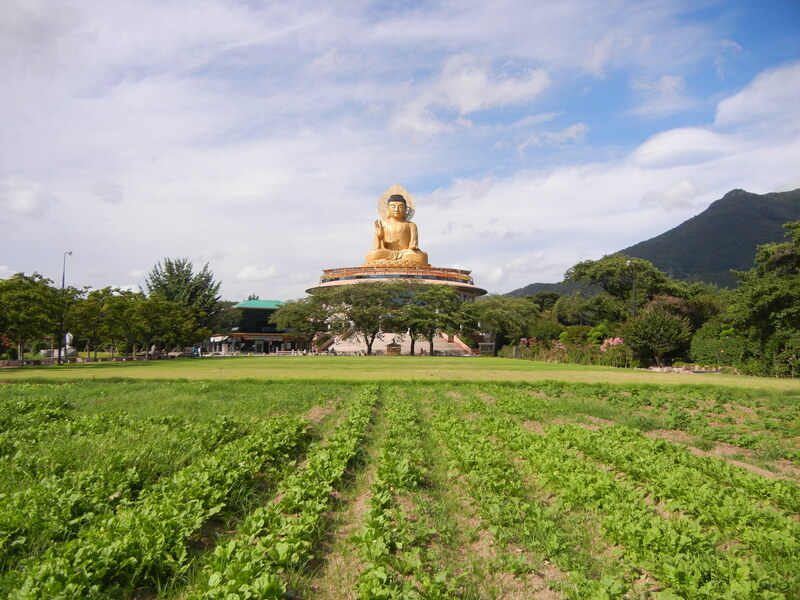 Naejangsa Temple has a 3 story pagoda and many lanterns The next temple, Wonjeokam, was up quite high and had a view, half golden painted Buddha, and a dog! 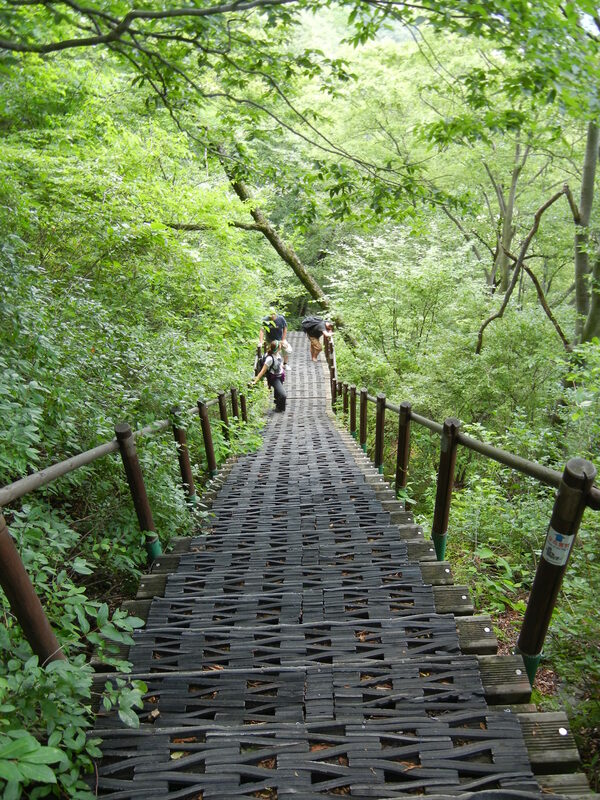 From there, it took 30 minutes to go .8 kilometers, which should give you a hint as to how difficult it was! Basically stairs the whole way. 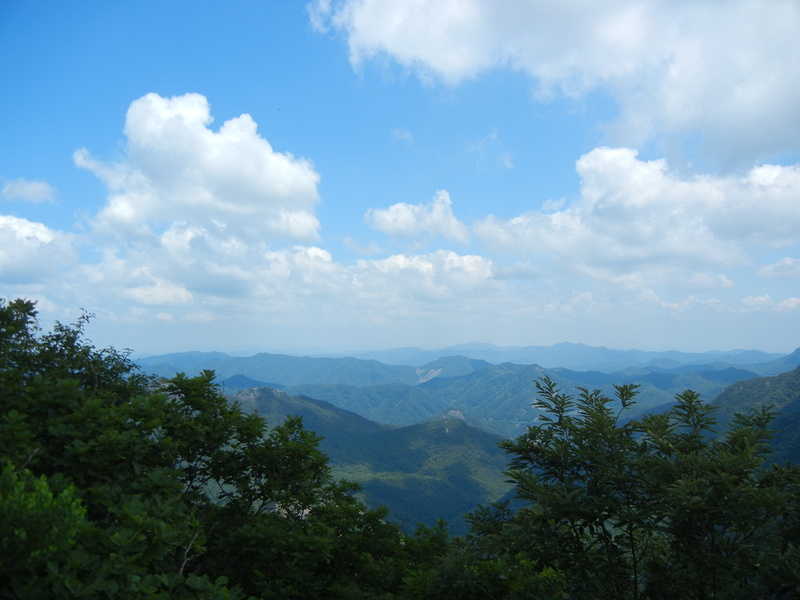 The next peaks were 678 meters and 670 meters. Finally, the highest was 717. The way back was mostly following a river. 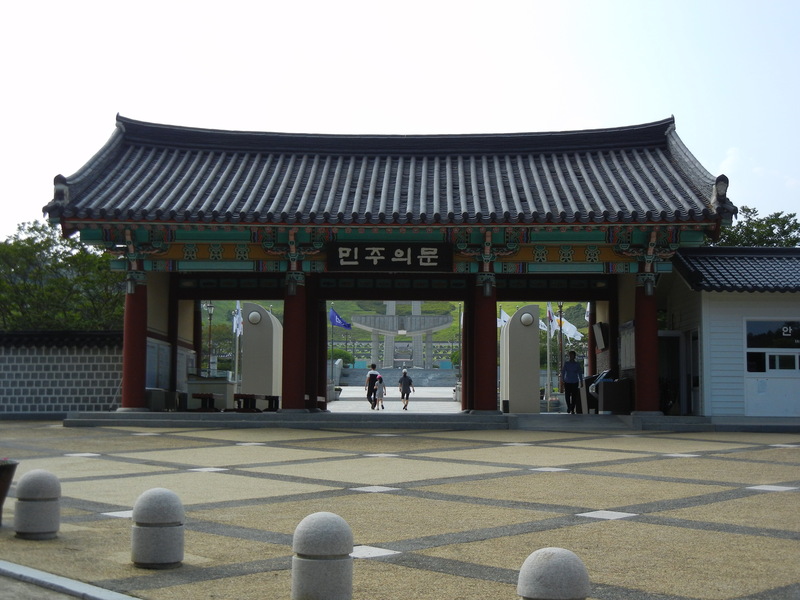 I went to Gwangju in the Fall and we didn’t get to see the Peace Park or Cemetery because one of the people I went with had already been there. We ended up wandering around more than anything else and getting a bit lost. 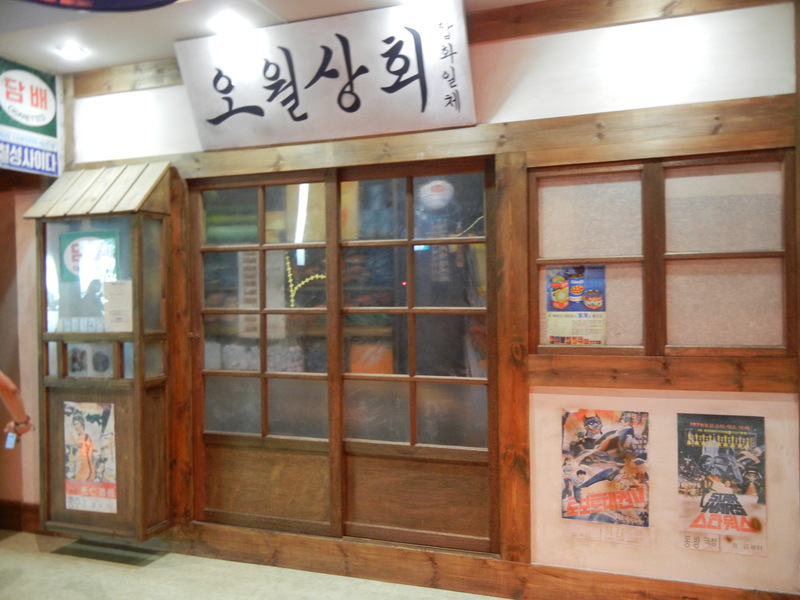 Gwangju is famous for student uprisings against the dictator during 1980-81. 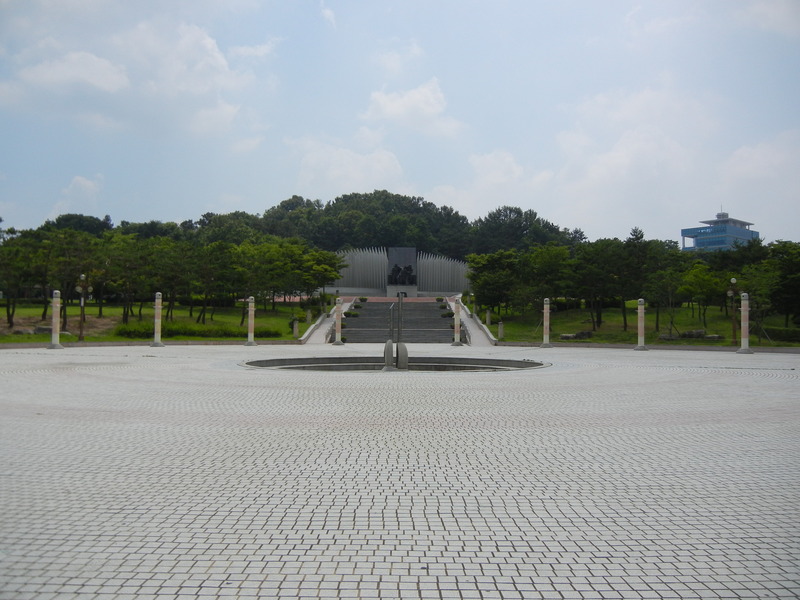 After arriving we went to Shinsagae to grab lunch again and started walking towards the Memorial Park, also called Peace Park. which is starred below on GoogleMaps. I hope you can tell which one is the park. It’s the opposite direction of Shinsagae. The A is just what shows up when you type in Gwangju. The park was pretty small, although it looks pretty big on the map. We unknowingly walked though all of it looking for a spot to have lunch. 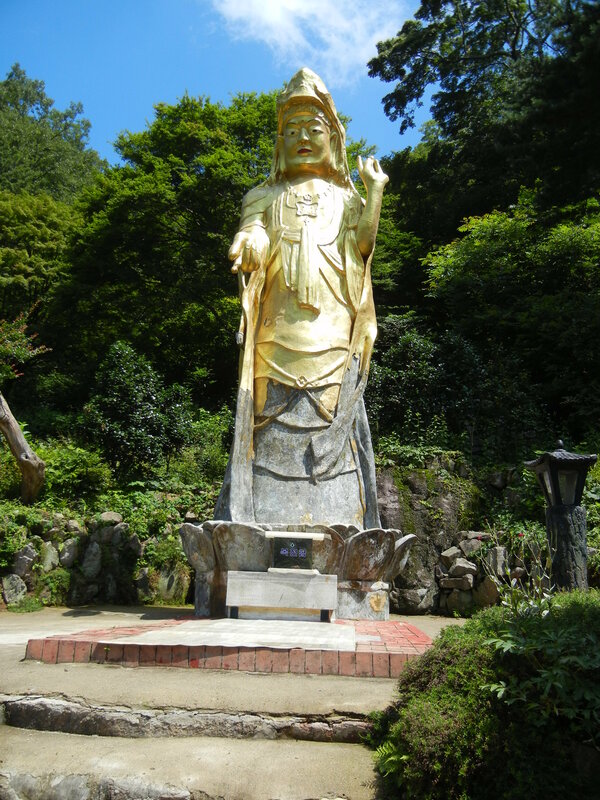 When you walk in from the North entrance, you see the statue below. 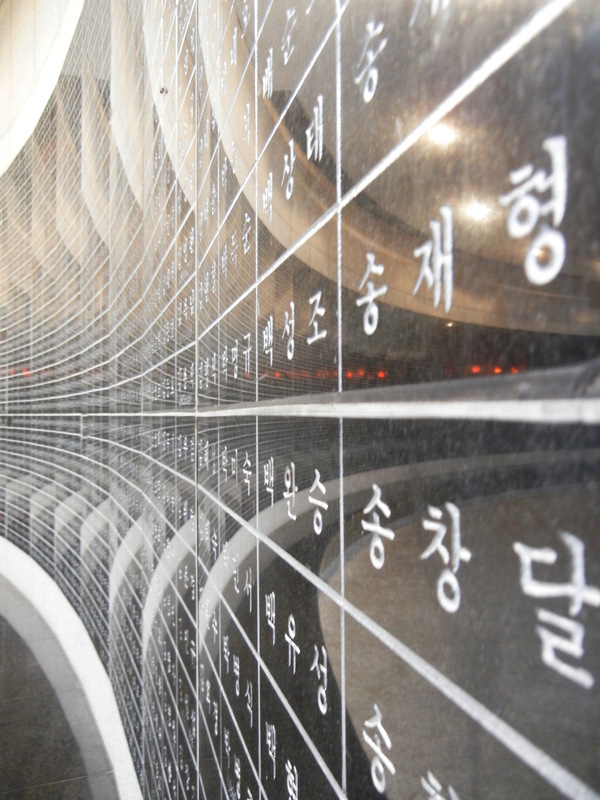 Behind the statue, there is an entrance to more of the memorial, the area where they have the names of the dead written on the walls. After that we took a taxi back to the bus station where we got an hour long bus to the cemetery. It is bus 518 to make things easier. I found out later that you can take it from the Peace Park as well. They come about every half an hour. From the bus stop you walk though the parking gate, past the parking lot to the entrance. 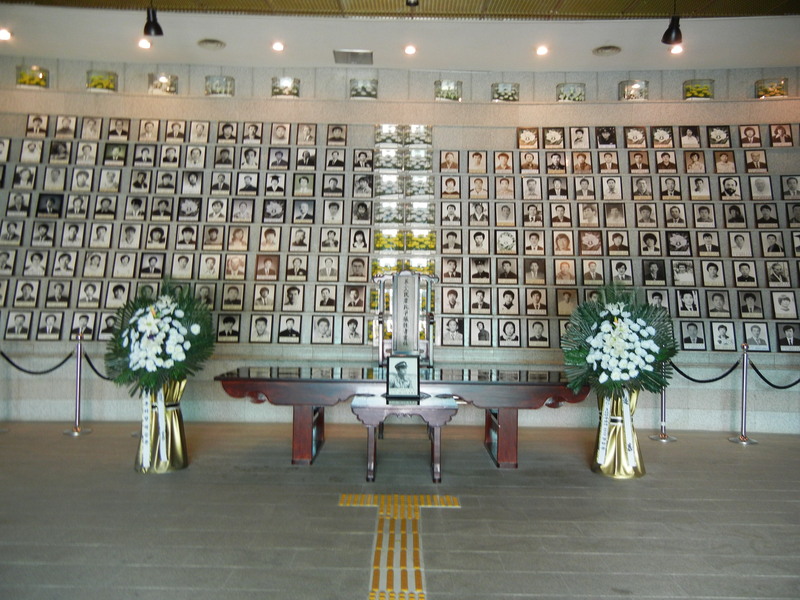 To the right there is the Yuyeongbonganso which is the place to put the portraits of the deceased May 18 democratic persons of merits. This is not just people who died during the massacre, but also people who were there and recently died. To the right is a museum. This included a detailed history, watched that had stopped when a person got shot or blown up, flags covered in blood, paintings people had done, a building the way things used to be, a machine gun, knife, a billy club, rocks covered in blood, dioramas, and a never ending stream. Note the Star Wars poster. One of the more interesting things I saw: The Joint Investigation Headquarters fabricated the truth about the May 18 Democratic Uprising by forcing false confessions through torture of the detainees. The people who fought for democracy and justice against the Gwangju massacre by the new military government were now arrested and sentenced to death or lifetime imprisonment by the military court for the crime of high treason and sedition. The injured who were being treated in hospital were forced to leave. 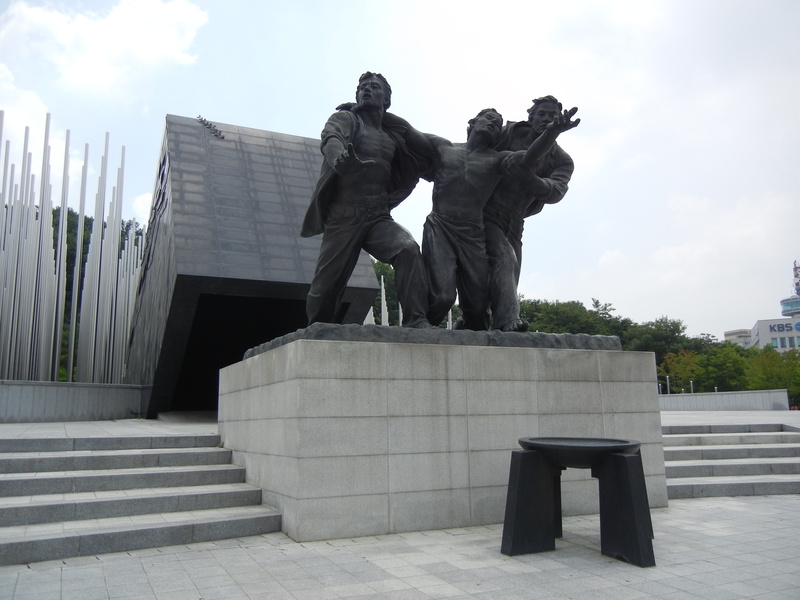 The Gwangju Massacre, the outcome of weapons of betrayal following the order for treason! and a 5-year old child was killed and buried in Gwangju, in May 1980! And those in power called it the suppression of a riot for social stability. though all people asked for was the truth about the brutally murdered bodies. 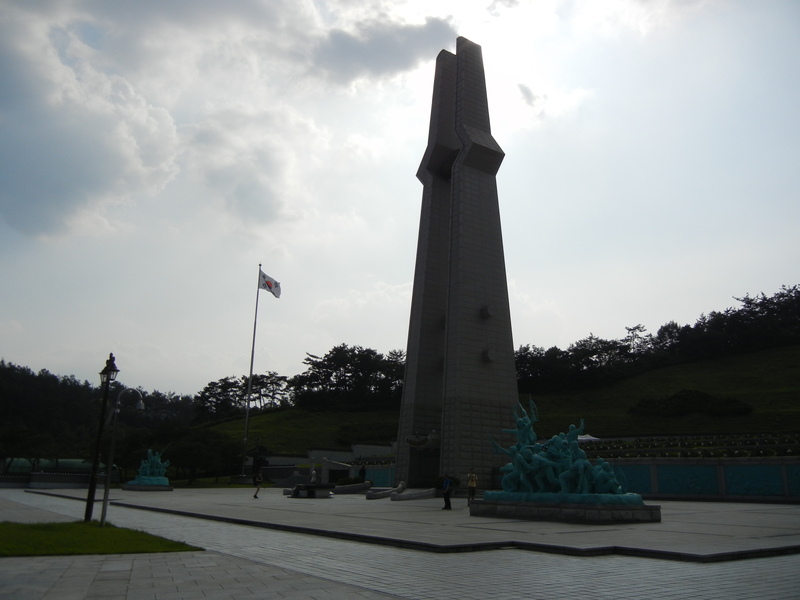 However, Gwangju could not be silenced though death as they wanted. The person who was the 11th and 12th President was given a life sentence and the Minister of Home Affairs and the 13th President was given a 17 year prison sentence. Further left, is the door of history, historical square, outdoor performing place, sungmoru (the castle-type building that old casatles monito red the surroundings), and the second cemetery. 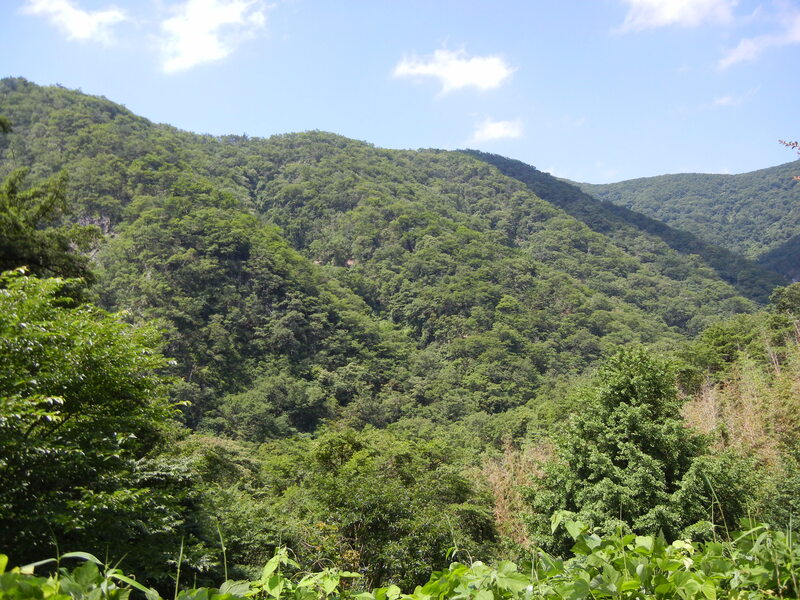 Below is the sungmoru. The way to the cemetery and back you will go past some graffiti.